In January the eagles arrive and nest near the river for the winter. Eagle Days feature special informational sessions and watching areas for all. For all bird watchers we have too many to list, but some species you will be able to watch include: coopers hawk, osprey, great horned owl, whistling swans, pelicans, many types of ducks, red-breasted merganser, red-throat woodpeckers and many many more. Warsaw offers excellent Eagle watching during the Winter months. There are 4 spots we recommend for premium Eagle watching. 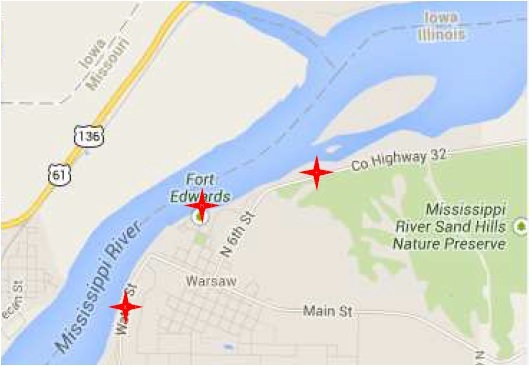 As you come into Warsaw from the North, you will see Kibbe Environmental Park to your left. This park features acres of nature trails but from the hill you can watch roosting and travelling Eagles. Check out the Kibbe Website here. Further into town, on the right is a pull out. You can see not only Eagles floating on the Mississippi River or flying above or sitting in a tree just beyond... but also see where the Des Moines River dumps into the Mississippi River and divides Iowa and Missouri. The view is just amazing. Once you leave there, you drive up the hill and take a right when you get to town. Go down a couple blocks until you run into Ralston Park, take a right and a right and you will be at the Point. This is the previous location of Fort Edwards in 1812. Saving the best for last, drive down elevator hill to Water St. and enjoy a mile of riverfront access and bird watching. Riverfront Park offers a lot of parking and vantage points. Felgar Photography is responsible for these photos. Please see more work by Felgar Photography on Facebook. WITO offers low pressure whitetail deer hunts in the premier area of West Central Illinois. Fully-guided and semi-guided hunts in Adams county and Hancock county are available. Our management program, low pressure and premier hunting properties offer WORLD-CLASS trophy opportunities. Our goal is to be the best Illinois Hunting Outfitter in the state. Come hunt with us. You'll enjoy Illinois deer hunting at it's finest! Catfish, Carp, Buffalo, Walleye, Striper, Perch and more!